Joel Schumacher directs the fourth Batman film, BATMAN & ROBIN, and once again teams up with visual effects supervisor John Dykstra. 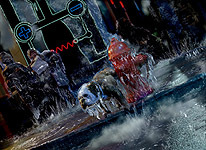 Schumacher put together virtually the same team he had for 1995's BATMAN FOREVER, including cinematographer Stephen Goldblatt and production designer Barbara Ling. 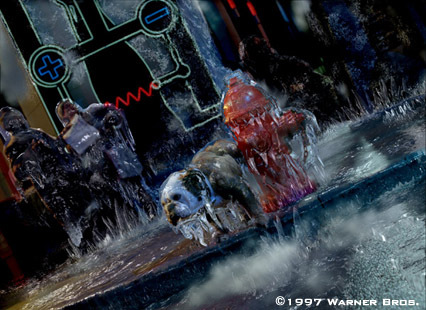 The result is a similar-looking film to BATMAN FOREVER, with its whacked-out sets, highly saturated colors, goofy dutch angles, over-the-top performances, and spectacular visual effects (over 400 shots), provided by a plethora of effects houses. This Batman film, more than any other, takes its visual effects to an extreme, riding the border between a live-action, realistic look and a fully-animated look. 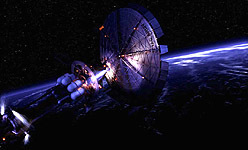 The visual effects certainly tilt towards the cartoonish side of motion pictures, as opposed to complete photorealism. Numerous CG stunt doubles were created and animated for BATMAN & ROBIN to complete stunts that are impossible to perform in real life, such as characters plummetting from hundreds of thousands of feet in the air. Some of the more memorable shots include Robin's landing and sliding down a slanted rooftop, with sparks and shingles flying off the roof behind him, and a lovely shot of a colorful CG flower blooming in front of Poison Ivy; the former is impressive since the flower is actually not the focus of the shot. The artists were daring enough to make the flower out of focus--something you will rarely see in visual effects shots. Most of the CG elements, including the CG stunt doubles, CG flowers and vines, and icicle creations are cartoonish, which fit their surroundings quite well. Why bother modelling, painting and animating fully photorealistic vines, while the production design, cinematography, editing and performances are not at all in a realistic vein? The lack of realism in BATMAN & ROBIN's effects cannot be used to criticize the effort, since the entire movie reeks of cartoonish images. BATMAN & ROBIN is also filled with dozens upon dozens of wire-removal shots. Although there are no digital artifacts or cues that wires have been removed, the shots certainly call attention to themselves. Director Schumacher wired up his stunt doubles for nearly every action sequence, and figured that no one would notice that he completely ignored the laws of physics--even "movie" laws of physics. Schumacher choreographed super-human, incomprehensible flight paths for his characters, jumping from one pedestal to another, falling from the ceiling, whatever. These shots simply scream "wire-removal" since the actor's movements are obviously being controlled by a flying rig, which is, of course, no fault of digital artist. 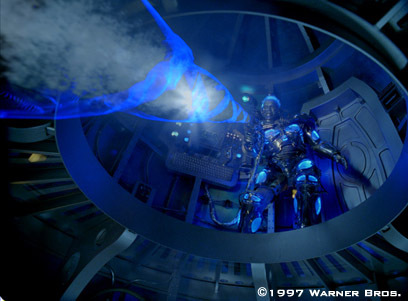 Warner Digital Studios provided numerous shots to BATMAN & ROBIN depicting Mr. Freeze's paralyzing freeze-ray. 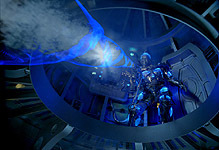 Warner Digital also used some clever and visually stunning techniques to show the results of Mr. 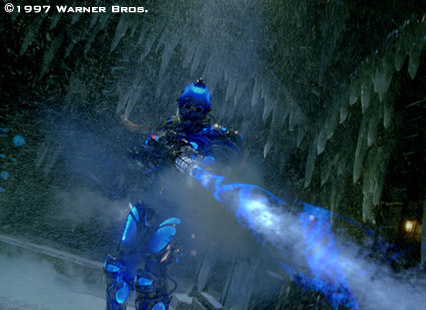 Freeze's gun; the instant freezing of the victims, along with the icicles and other ice elements. The effects produced by the now-defunct Warner Digital are particularly interesting, due to the unique production technique. In addition to creating CG versions of the Batmobile and Freezmobile, WDS created the stunning effect of the instant-freeze, inflicted upon the citizens of Gotham by Mr. Freeze (Arnold Schwarzenegger). 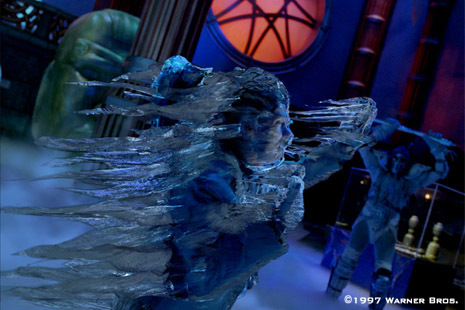 Freeze's weapon instantaneously freezes people, leaving a glacial, semi-transparent layer around the victim. Schumacher insisted to use a moving camera in these shots, circling the victim during the freezing process. Because of the difficulty in asking an actor to hold position perfectly while the camera rotates around him, Warner Digital created CG models of the victims using stereo-imaging. A series of cameras positioned around an actor are synched to take an image at exactly the same time--Joel Merritt at Warner Digital developed the system to take these images and derive a 3D model of the actor. After texture mapping and match-moving, the image is composited into the background plate, along with Dynamation-created ice effects. Be sure to check out the complete list of Warner Digital Credits. Rhythm & Hues Studios provided BATMAN & ROBIN with five key shots in the film, all of the space-satellite shots. Check out American Cinematographer July '97 and Dec. '97.